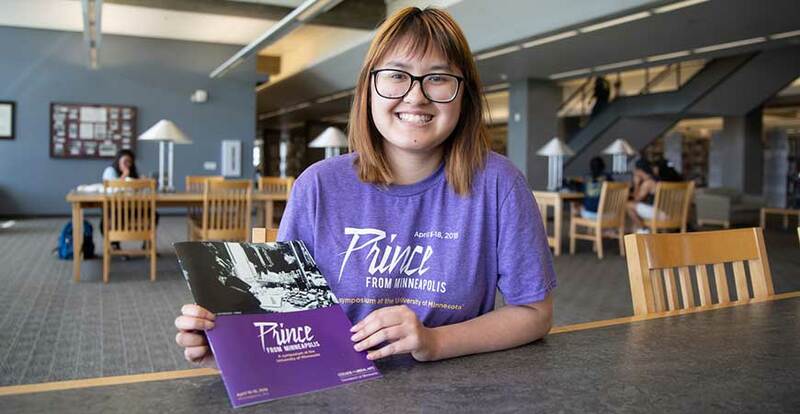 Dalena Ngo, a first-year graduate student in the Interdisciplinary Humanties program, presented a paper about music artist Prince during a research symposium at the University of Minnesota last month. Dig if you will, a picture: the chance to study Prince – the musician and purveyor of all things purple -- as a subject of academic research. UC Merced’s Dalena Ngo did. For years, Ngo – a Minnesota native and lifelong Prince fan – wanted to examine aspects of the musician’s 40-plus year career and his influence as a cultural icon. As a graduate student in the Interdisciplinary Humanities program, she’s been able to do just that. Last month, Ngo was one of dozens of scholars from around the world to participate in “ Prince from Minneapolis: A Symposium at the University of Minnesota .” Scholars presented papers and participated in panel discussions that covered multiple aspects of Prince as a performer and an individual. Ngo presented her paper, “Music, Masculinity and Minnesota: Means of Resistance” during the three-day symposium that coincided with events scheduled to memorialize Prince during the week leading up to the second anniversary of his death. Her scholarly interest in the “Purple Rain” megastar started when Ngo was an undergraduate student at St. Olaf College in Northfield, Minnesota. She had been a fan of his work “for as long as I’ve been alive” and her interests extend beyond his music. She was fascinated by his expressions of gender, sexual and racial identity; his use of symbolism; his frequent forays into religion, politics and social justice; issues involving music authorship, creation and ownership; fan culture; and even his impact on color association. Ngo was already mulling topics she could investigate when Prince died April 21, 2016. That’s when her thoughts started coming into focus. She credits UC Merced with providing her with unique research opportunities. Ngo, who is completing her first year in the IH program, said her experiences have been stellar thanks to support she’s received from her advisor, Critical Race and Ethnic Studies Professor Kit Myers, and other faculty members in the program. Myers and Professor Sean Malloy encouraged her to pursue the Prince research. She’s presented papers at two Prince symposia — the recent one in Minneapolis and another held at the University of Salford in Greater Manchester, England , in 2017.